We hope you are having a fantastic year so far! This week, for Foundations, I share a few memory hooks that we find to be helpful. In Essentials, I celebrate you! You have made it through the first three weeks, and this week, we play with the imperative purpose together. I also teach songs for memorizing interjections and implied subjects in an imperative sentence. Have fun throwing in those interjections this week! They can be one-word, or multi-word interjections. They are most easily identified by exclamation points, but at times are sneakily hidden before commas. May you and your student play with the charts! May you start discussing them as you parse sentences together. Diagramming is fun!!! I thank you so very much! These are so helpful. I’m thrilled that they are helpful! Thank you for your videos. They are great and very helpful. Will you be doing this for each week? I hope so! A fellow CC mom shared your page with me and I love the Foundations Videos that you’ve posted!! My students really mastered their geography using your awesome memory joggers!! 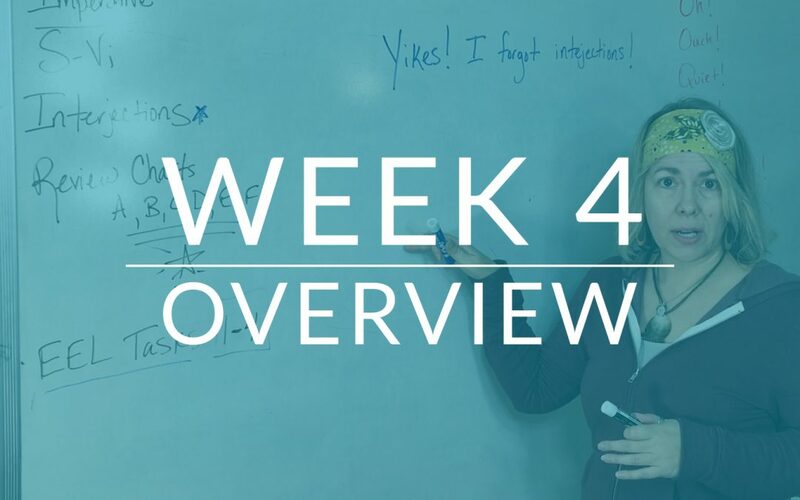 I noticed that week 4 is the last that you’ve posted. (We are on week 7 so I’ve eagerly checked back countless times each week! Lol) I can only imagine how busy you are, doing all the amazing things you do!! Do you have plans to continue posting these videos for future weeks? I know our community would love to see more of you on videos for future weeks! 😁 Thanks for considering it and have a blessed week! Ami!!! These videos are so helpful! Do you have week 5-10 anywhere? We missed a whole month of Essentials due to an injury and I am trying to catch up over the break. Thanks so much!